I attended one interview at that time they asked one question that is it possible to use multiple web.config files in single asp.net application? For that question answer is Yes we can use multiple web.config files in single web application but how? 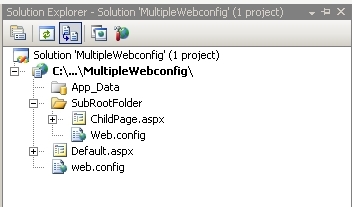 By creating web.config file in sub root folders we can use multiple web.config files in our application but each folder should contains only one web.config file. Here I will explain step by step how we can use multiple web.config files in our application. If you observe above outputs Default.aspx page getting values from root folder web.config file and ChildPage.aspx page getting values from subroot folder web.config file. if i want to have multiple keys in a single web.config in root but the keys may be duplicate & path is different for the value of keys is it possible?? i want to link two number of web application to another web application (that is to the third one. ), to access that two apps data to the third one. Please do the needful. which is first working web.config root or subroot? i want only one web.config call at the time what i am doing? Error:Server Error in '/webconfig' Application. The application setting 'rootfolder' was not found in the applications configuration. Server Error in '/webconfig' Application. i got this error .please help me. Two connection strings are usefull in one webcinfig..
What is the use full in usage of multiple web config files in single application.